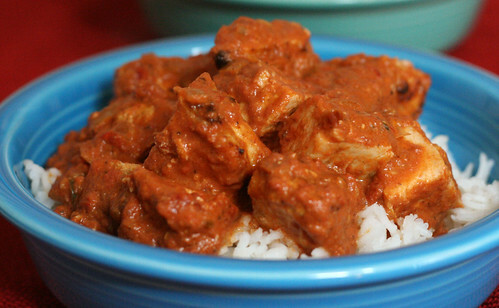 Chicken Tikka Masala is one of my favorite dishes to order at Indian restaurants. In an effort to keep pushing myself with new techniques and flavors in my cooking, I took on the challenge of making it myself recently, fighting my innate urge to pick up the phone and order takeout. It's genetic. Thanks, parents! Whenever I try making a complicated new dish from scratch for the first time, I usually use the Cooks Illustrated/America's Test Kitchen version of the recipe. Their scientific approach to testing recipes helps me feel like I'm in good hands, and I've never had a bad experience with the dozens of their recipes that I've tried. While this recipe didn't at all replicate the dish I know and love from my favorite Indian restaurants (this was far more tomato-y), we still enjoyed it. The chicken, broiled in a thick coating of yogurt, garlic, and ginger, was the moistest and most flavorful chicken I've ever made. The sauce had just the right balance of heat, tomatoes, and spices. Served over basmati rice, this dinner made me a very happy girl. I'm just going to have to keep researching to find a recipe for the take-out version I know and love. 1. For the chicken: Combine cumin, coriander, cayenne, and salt in small bowl. Sprinkle both sides of chicken with spice mixture, pressing gently so mixture adheres. Place chicken on plate, cover with plastic wrap, and refrigerate for 30 to 60 minutes. In large bowl, whisk together yogurt, oil, garlic, and ginger; set aside. 2. For the sauce: Heat oil in large Dutch oven over medium heat until shimmering. Add onion and cook, stirring frequently, until light golden, 8 to 10 minutes. Add garlic, ginger, chile, tomato paste, and garam masala; cook, stirring frequently, until fragrant, about 3 minutes. Add crushed tomatoes, sugar, and salt; bring to boil. Reduce heat to medium-low, cover, and simmer for 15 minutes, stirring occasionally. Stir in cream and return to simmer. Remove pan from heat and cover to keep warm. 3. While sauce simmers, adjust oven rack to upper-middle position (about 6 inches from heating element) and heat broiler. Using tongs, dip chicken into yogurt mixture (chicken should be coated with thick layer of yogurt) and arrange on wire rack set in foil-lined rimmed baking sheet or broiler pan. Discard excess yogurt mixture. Broil chicken until thickest parts register 160 degrees on instant-read thermometer and exterior is lightly charred in spots, 10 to 18 minutes, flipping chicken halfway through cooking. 4. Let chicken rest 5 minutes, then cut into 1-inch chunks and stir into warm sauce (do not simmer chicken in sauce). Stir in cilantro if using, adjust seasoning with salt, and serve. I don't cook many Indian dishes. I should try this! This looks wonderful, I will add it to my list ;). I love this dish. I have never made it though. Thanks for sharing the recipe. We may just have this for dinner tonight! This is my favorite tikka masala recipe. It's delicious!! I like the Saveur recipe as adapted slightly by in praise of leftovers It's still pretty tomato-y, but doesn't have tomato paste or added sugar. My friend who is married to an Indian man says that it's pretty close to his family recipe. hi- I would omit the sugar and heavy cream try coconut milk. It adds a more authentic creamy/sweetness. it certainly does look moist! yep, those hooligans at the test kitchen get it right most of the time. great dish--i'm not even daunted by the lengthy list of ingredients! Kudos to you Amy. I've been trying to step out of my norm and give new techniques and flavors a try but for some reason, I just get stuck in the same kitchen, mine. Thank you so much for your inspiring post. I think you're right. When I do, I'll have to did out my Cook's Illustrated Magazines. I have tons:) Your meal looks awesome!!! My husband and I LOVE this recipe! It definitely doesn't taste like restaurant tikka masala, but it's as close as we've found to make ourselves. I also don't eat meat, so I add in some sliced bell peppers or squash right at the end. Super tasty. Nice dude!!!! Love this dish!!!!! This looks like a great weeknight meal. Great list of spices/flavors in here.